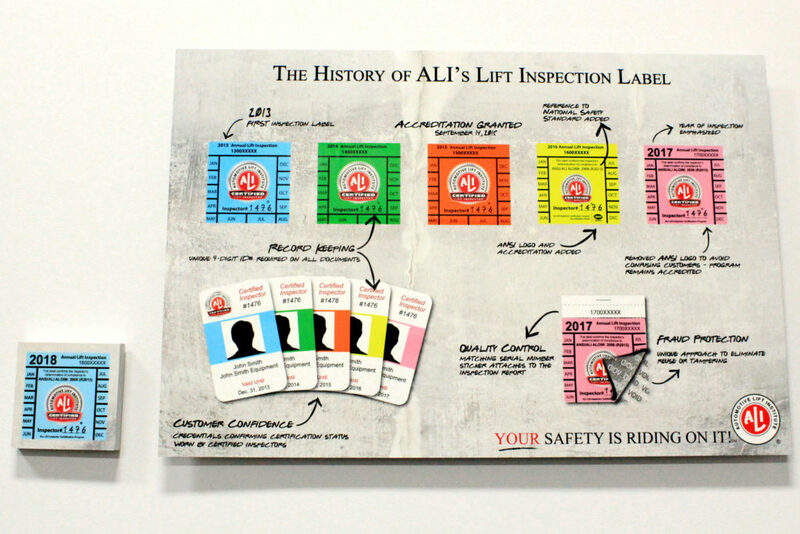 CORTLAND, NY – (May 29, 2018) – The Automotive Lift Institute, Inc. (ALI), an ANSI accredited product certification body (Accreditation ID# 0584), hereby makes public announcement that counterfeit lift inspection labels have been found in New York City and Long Island with records going back to at least 2016 (see image at right). 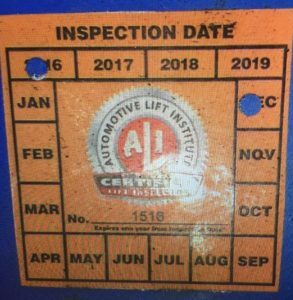 In recent months, various vehicle service lifts have been reported to display counterfeit inspection labels bearing ALI’s Certified Lift Inspector mark. Use of this counterfeit mark unethically leads shop owners, service technicians, Department of Transportation inspectors, and Occupational Health and Safety officials to believe that an inspection performed by an ALI certified inspector had occurred. These fraudulent labels resemble ALI’s annual inspection label but have been applied by a company that is not affiliated with ALI in any way. Representation of ALI’s registered mark on labels such as the one in the image presented above is not authorized. Automotive lifts bearing the label depicted should have this label removed immediately, and the lift should be re-inspected by a qualified lift inspector. As of this notice, there have been no reports of damage or injury presented to ALI related to this counterfeit inspection service. The labels were found in multiple automotive shop facilities throughout Brooklyn, the Bronx, and Long Island. If you have contracted the services of Gemco Garage Equipment Corporation said to be located at 15375 Rockaway Boulevard, Jamaica, NY, be advised that this company is not eligible to use ALI’s Lift Inspector Certification mark, it is not affiliated with ALI, and ALI intends to prosecute this unethical approach that undermines public trust and lift safety. Consumers with lifts bearing these labels (depicted above) are advised to contact ALI immediately and seek out inspection services from a qualified lift inspector. To locate the ALI Certified Inspector nearest to you, visit the Directory of ALI Certified Lift Inspection Providers at http://www.autolift.org/find-a-certified-auto-lift-inspector/. ALI continues to promote the safe design, construction, installation, inspection, and use of automotive lift products. The integrity of the ALI annual inspection label and the ALI Certified Inspector mark are of paramount importance. The image depicted below is an example of ALI’s annual inspection labels from 2013 – 2018.